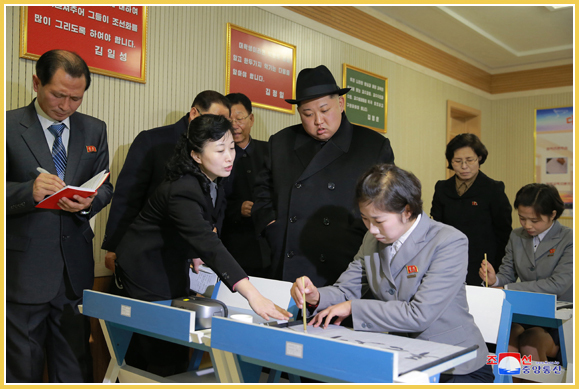 Kim Jong Un, Chairman of the Workers’ Party of Korea, Chairman of the DPRK State Affairs Commission and Supreme Commander of the Korean People’s Army, provided field guidance to reconstructed Pyongyang Teachers Training College. He was accompanied by Pak Thae Song, vice-chairman of the WPK Central Committee, and Jo Yong Won, deputy department director of the WPK Central Committee. He got familiar with reconstruction and modernization, and instruction and edification while looking round the room dedicated to the college’s history, education and science exhibition hall, education control room, multifunctional lecture room, library, gym, dormitory and other places of the college with a total floor space of over 24 100 square metres. Established in September 1968, the college could follow the proud course of its development under the wise leadership and meticulous care of President Kim Il Sung and Chairman Kim Jong Il, he said. The officials and teaching staff of the college, he noted, should keep in mind the importance of their duty and dedicate their intelligence and enthusiasm to education so as to add eternal brilliance to the undying exploits of the great leaders. The college has made notable achievements in scientific research in the past, he said, adding an improvement in education cannot be expected apart from success in educational science. Saying that all the lecture rooms including a room for practical training in how to teach primary school pupils, a room for acquiring teaching methods for experiment in natural science and a room for diffusing the technique of developing children’s intelligence have been turned into multifunctional ones to conduct specialized practical training, he described the method of giving lessons in virtual and actual situations as novel and distinctive. The method of evaluating students’ performance by teachers’ standard and other teaching methods adopted in a classroom furnished to combine school education and family education are also advantageous, he stated. He was very pleased to see that the college is equipped with such cutting-edge educational apparatuses as 3D image input device, 3D printer and electronic board, sophisticated teaching tools and management and operation facilities, he said. He was greatly satisfied to say he feels as if he has plucked stars from the sky and provided the educationists in charge of the future of the country with golden cushions and he can vividly visualize the rosy future of the country. The viewpoint and attitude toward the reality are altered and consolidated according to how human beings receive what kind of education in their childhood, an important stage in which human intelligence develops, he noted. The Party attaches importance to teachers training colleges, the “pedigree farms” for the training of teachers of children, and that is why it saw to it that Pyongyang Teachers Training College was renovated with much effort, he said, underlining the need for every province to spruce up their teachers training colleges with the one in Pyongyang as a model. He had a photograph taken with the officials, lecturers and students of the college.